Bring a little novelty to an everyday device. As a unique alternate to the popular USB people this robot is pretty cool. 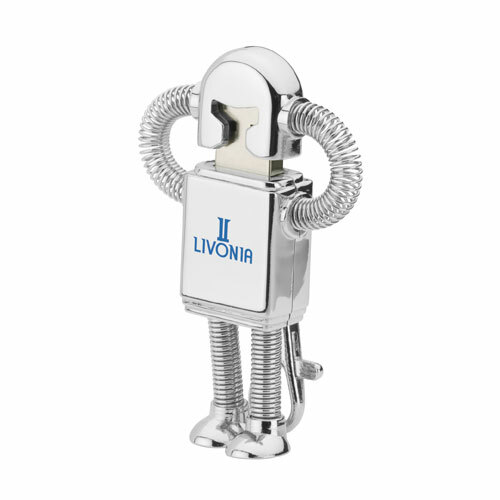 Robot USB Drive has an attractive shiny metal design and originality that makes it fun and interesting! 1GB Robot Drive is a definite conversation starter. Futurama fans may be reminded of Bender. Except, this robot bends for attention and cooks up sales. He carries about your data while getting you noticed. This little guy is a 1GB drive and includes a clasp to attach to your keychain, briefcase, or purse. Robot USB Drive arms are flexed showing his muscle powers. Attached cap-off plastic and metal USB drive. 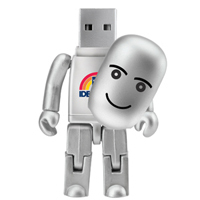 Save your marketing galaxy one gigabyte at a time with promotional USB Robots key chains.